My German immigrant grandfather in Peoria wrote the following account in his diary in the fall of 1918. It’s sort of timely due to current health events going on around the world right now. It’s been five weeks since I last wrote anything. There have been great changes in Peoria and the world. Since the beginning of October, in almost all the states of America, a terrible epidemic has broken out, called the “Spanish Influenza.” It was most notable in the barracks among the soldiers. It begins with a cold, then a fever and so on until pneumonia sets in, and most die. I was sick with it. I immediately went to the doctor and spent three days in bed. Since I did not have any real care at home, I suggested that I go to the hospital. After two days in the hospital, I felt much better. I was there for a week. All I needed was a good rest, which I received. I did not go back to work right away and the expenses cost me a lot of money. I had used up all my savings. After reading up on the Spanish flu, I realized that he’s pretty lucky to have made it through alive. According to wikipedia, the 1918 flu pandemic which lasted January 1918 through December 1920 was an unusually deadly influenza pandemic. It infected 500 million people across the world and killed 50 to 100 million of them — three to five percent of the world’s population — making it one of the deadliest natural disasters in human history. Wow. Can you imagine losing 3 to 5 percent of everyone you know? That’s a lot of friends and family to lose from this one flu. Most influenza outbreaks disproportionately kill juvenile, elderly, or already weakened patients. But the 1918 pandemic killed predominantly healthy young adults. Modern research, using virus taken from the bodies of frozen victims, has concluded that the virus kills through an overreaction of the body’s immune system. The strong immune reactions of young adults ravaged their bodies, but the weaker immune systems of children and older adults resulted in fewer deaths among those groups. Amazing. Why was it called the Spanish flu? 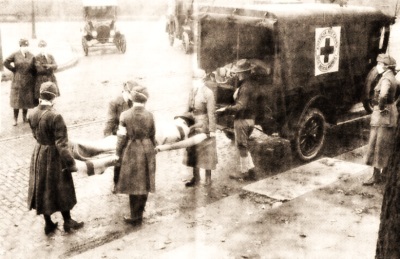 To maintain morale, wartime censors minimized early reports of illness and mortality in Germany, Britain, France, and the United States, but papers were free to report the epidemic’s effects in neutral Spain creating a false impression of Spain as especially hard hit — thus the pandemic’s nickname Spanish flu. The Emperor’s days are numbered. Almost every day here, boys are leaving to get soldier training. I went to many farewell parties for my friends. In March, I bought a war bond for $100 which I can redeem in 1928 for an additional four and a quarter percent interest. Big Freedom, Red Cross and many other parades are being held from time to time. After July 1st all men in store positions, waiters, theater employees and so on must look for a spot in factories and women are taking their places. Five million men were sent to France in order to beat the Emperor. I hope the war will find an end soon. I believe you feel sorry for me, but do not fear, all Americans treat me well. All German language was exterminated in the schools and even in the churches. The high schools have burned all German books. You can’t believe how everyone hates the Emperor, even I. If what all the papers write is true, it must be horrible. Prisoners are being treated badly. Arms, ears and noses are cut off and they are being hanged. Belgian and French girls, women and children are murdered, burned alive and buried. The hospitals are bombed. In an American theater, a picture was shown entitled “The Emperor, Beast of Berlin” and a man in the audience was so angry that he shot at the screen in his rage. He made a big hole in the white curtain and said, “If I can’t get him there, I will get him here.” I could relate a thousand things of how hated the Emperor is, but soon they will get him and then it will be the end of the war. This was a big day. All men from eighteen to forty-five have to register. In Peoria alone, 14,000 men had to go. When they are all deployed, it’s good night Germany. I wished I could go too. I am safe and sound despite the fact that, now, I don’t have much money. All my savings are being used up. Food and clothing are very expensive. I hope the war will be over soon.